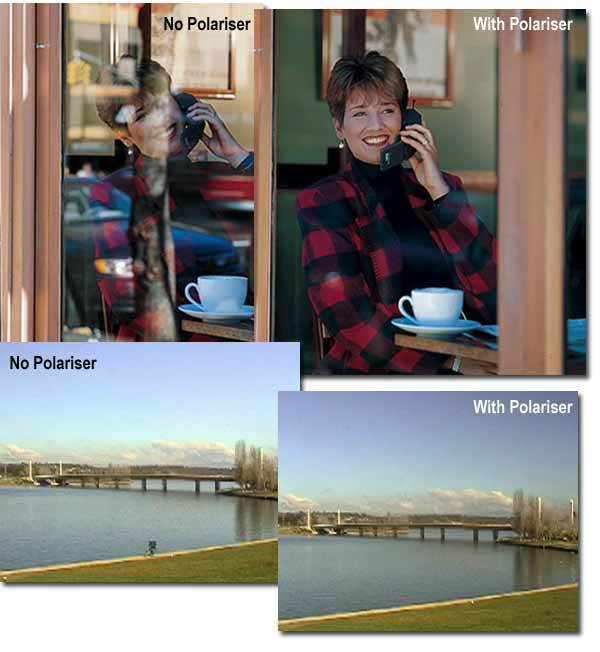 Polarizers provide color and contrast enhancement. Reflected light often shows up as whitish glare that washes out color in an image. A Polarizer corrects this problem producing deep, dramatically blue skies. It also removes glare from non-metallic surfaces, such as windows and water. Color saturation in general, especially outdoors, can be improved significantly. A Circular Polariser has the same effect as a Polariser and is used on cameras with beam splitting metering systems commonly found on auto focus SLR's (for most 35mm auto-focus cameras see your camera manual). Point your index finger at the sun. With your thumb extended at a right angle (90? ), rotate it around the axis of the index finger. It will point out the band of deepest blue from horizon to horizon.